"Open, sesame!” I love the magic! This Marinated Sesame Chicken Recipe is magic and creates a very popular restaurant meal and a family favorite. This easy chicken recipe satisfies the desire for Chinese or Asia food and it does it without any additives. 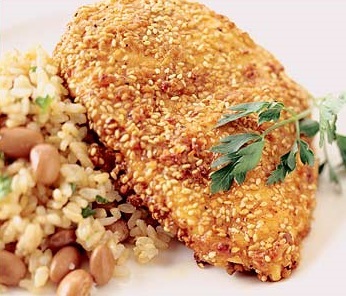 It is a healthy restaurant chicken recipe for you to prepare in your own kitchen. I serve the chicken with, or over, rice and add some stir-fried vegetables on the side. 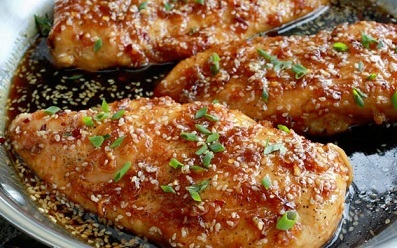 This Sesame Chicken can also be a delicious topping to a salad. You can create an Asian restaurant-style salad simply by adding this chicken! Note: To toast sesame seeds, place in a baking dish or pie pan in a 300 degree F oven for about 5-6 minutes. You must keep a close eye on the seeds so as not to burn. Serve with Asian Wild Rice Salad or Chinese Noodle Salad and some Stir-Fried Vegetables. Add a side of Corn Salsa for an extra enhancement! 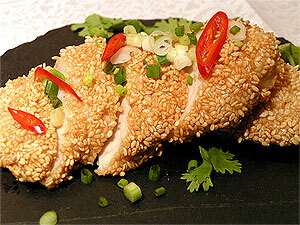 Enjoy your Marinated Sesame Chicken Recipe and the company of those you share it with! Did you know? Soy sauce is a traditional ingredient in East and Southeast Asian cuisines, where it is used in cooking and as a condiment. It originated in China in the 2nd century BCE and spread throughout Asia.